Towards the end of last year, nine Chinese teachers from Putuo District, Shanghai, visited Surrey as part of a British Council’s connecting classrooms’ project, 'a day in the life'. The Chinese teachers spent three action-packed days in their partner schools including The Abbey. Children and teachers shared their experiences of home and school life in England and China. Many pupils made and sent Christmas cards with a Chinese greeting to their friends in Shanghai. 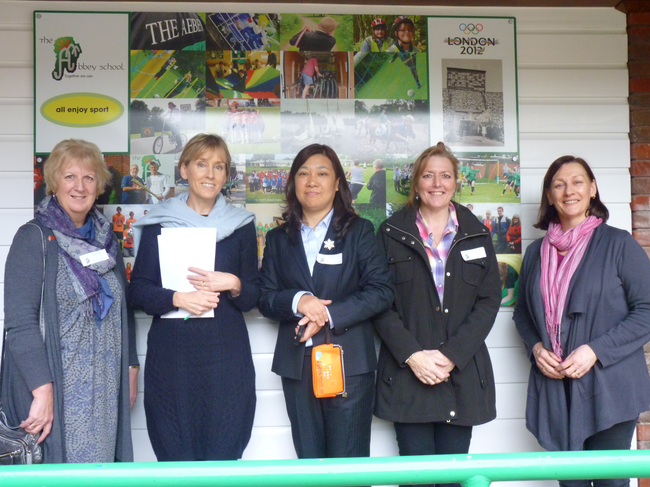 Here, the group were taken on a tour of the school by Mrs Price and Mrs Rendall. The Chinese teachers were impressed by Surrey's commitment to excellent teaching and the children’s motivation to learn. They observed and participated in lessons, especially where young learners were discovering facts about China. Activities with the children included ribbon dancing, practising Mandarin, using chopsticks and perfecting the art of paper-cutting. Surrey teachers will visit China next, spending a week in their partner schools during the Easter holidays. As part of the Anglo-Sino project within Surrey, the Abbey School will be participating in a Festival of Chinese Arts which will celebrate elements of Chinese culture such as dance, songs and calligraphy, among others. Plans are being drawn up but initial thoughts are that this will be happening in June.